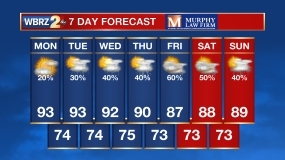 Monday made it to 96 degrees with 30 percent of the forecast area receiving rain, as expected. Summer shower and storm development tends to be random and while geographical coverage can be forecast, location often cannot this time of year. On Monday, bad luck with the rain placement and timing—right over the Capital City during rush hour! Today and Tonight: Tuesday is expected to be partly sunny and hot early with a high temperature in the low to mid 90s. Showers and thunderstorms will first appear along the coast early and then a few will develop inland during the afternoon hours. That activity will dissipate at night with a low in the mid 70s. Up Next: The remainder of the week won’t see much change, but we may notice a slight uptick in rain coverage around the area. 40 to 50 percent of the 13 Parish, 3 County forecast area will receive a shower each day. Skies will be partly sunny otherwise. We’ll expect highs in the low 90s with lows in the mid 70s. The Tropics: Showers and thunderstorms are becoming more organized as the system brings rain and wind to Jamaica. There is still no defined center of circulation and for that reason the National Hurricane Center has not yet designated a named storm. Hurricane Hunters are expected to fly into the storm later today, looking for more information. Further development and thus a designation of “Earl” is expected. However, the storm will remain south, affecting the Yucatan Peninsula. There will be NO impact in Louisiana or Mississippi. Forecast Discussion: An upper level ridge of high pressure will remain over the region through Wednesday. Underneath, marine breezes and daytime heating should be enough to at least spark isolated convection each day, but thanks to the ridge, action just won’t be as widespread. Temperatures will be very close to seasonal normal. The upper ridge will weaken a bit by the end of the week which should result in slightly higher rain coverage. More good news about that upper level ridge—it should keep the mid-level steering winds across the Caribbean Sea and Southern Gulf of Mexico from east to west meaning that any tropical systems in the near term will be pushed away from the Gulf Coast.